I grew up in Middletown, Connecticut, the official sister city of Melili, Sicily, in Italy. 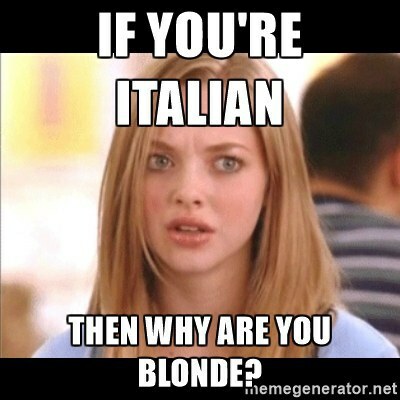 I grew up living with my grandparents and my mother, all of whom are mostly Italian. 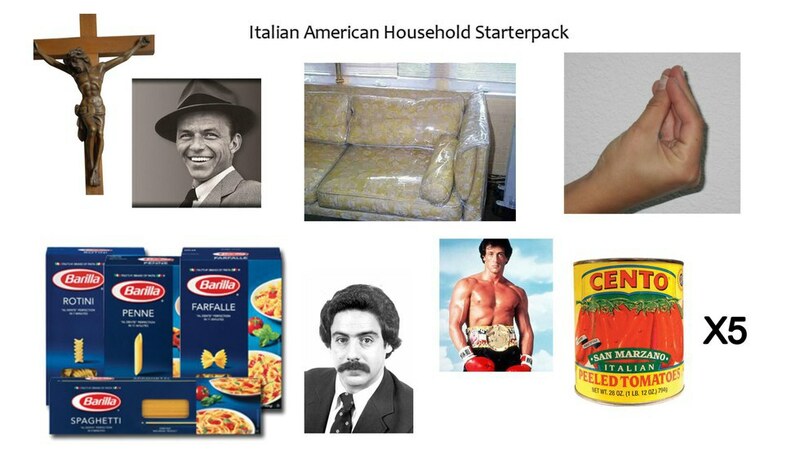 These are the telltale signs you grew up in a traditional Italian household like I did. 1. Your last name ends in a vowel. My family name is Talevi. My best friend's is Bibisi. You get the idea. 2. You talk with your hands. 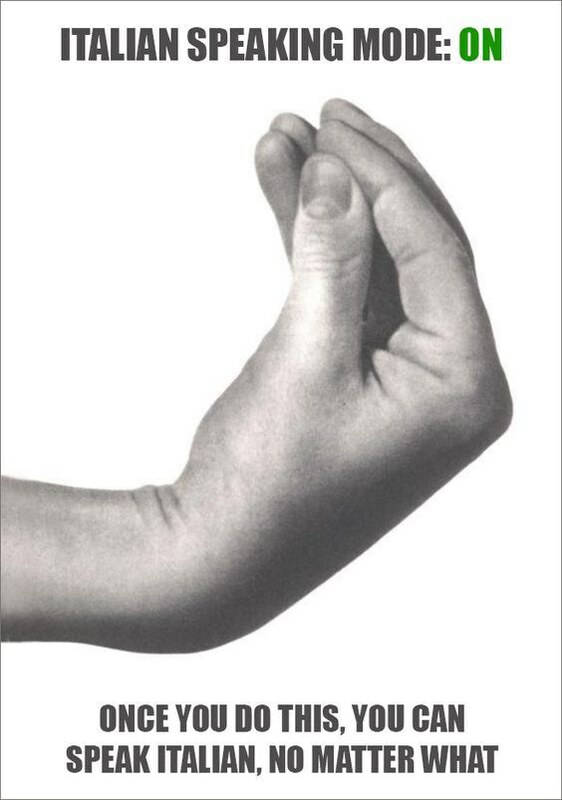 Are you even Italian if you don't use hand gestures for every sentence that comes out of your mouth? 3. You never say no to food. 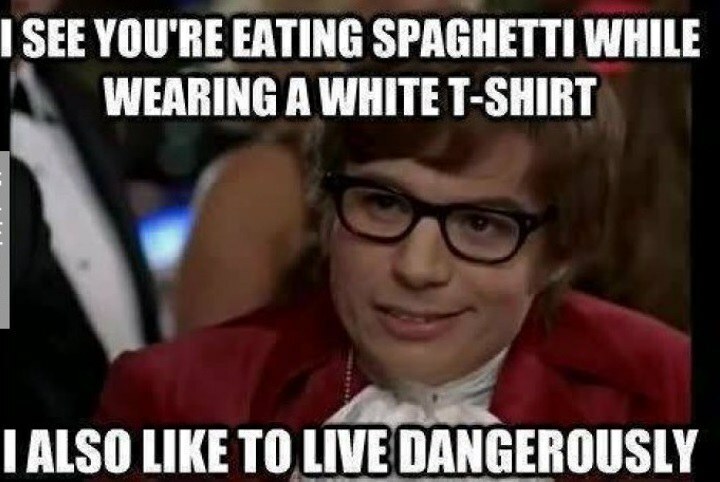 Even if you’re not hungry, you eat anyways. 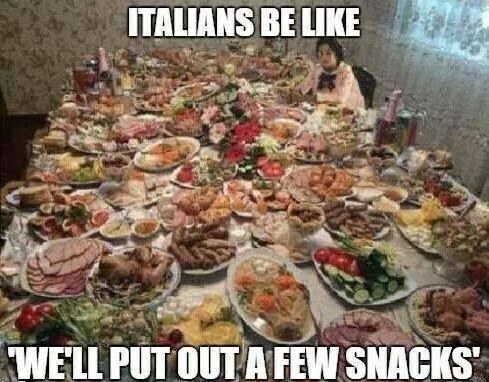 Italians hold the value that when a guest enters the house, he or she must eat. If you reject food when it is offered to you, it is perceived as rude. 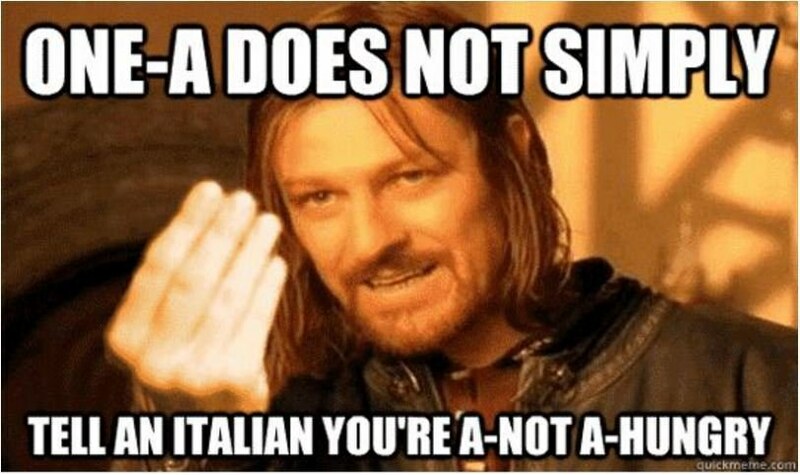 This means that even if you don’t come into the house hungry, when Nonna offers you a home cooked meal, you eat it. And if you are offered seconds, you better take that too. 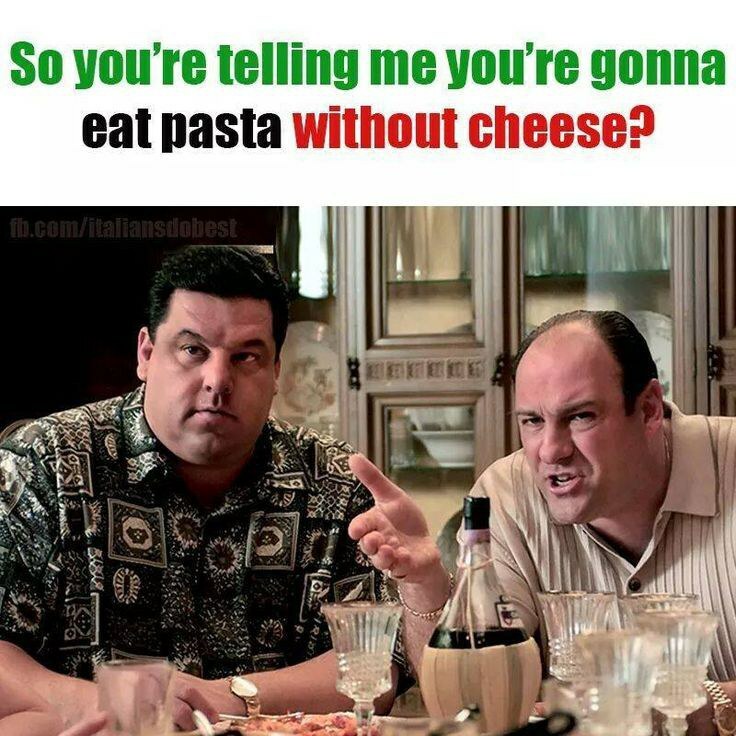 You never leave an Italian household hungry. The interaction will go something like this. 4. Everyone yells in your house. No one is angry. That's just how we talk. 5. Dinner discussions revolve around food. You talk about what you ate earlier that day, and what your next meal is going to be. It's disgusting, really. 6. Everyone talks at the same time. 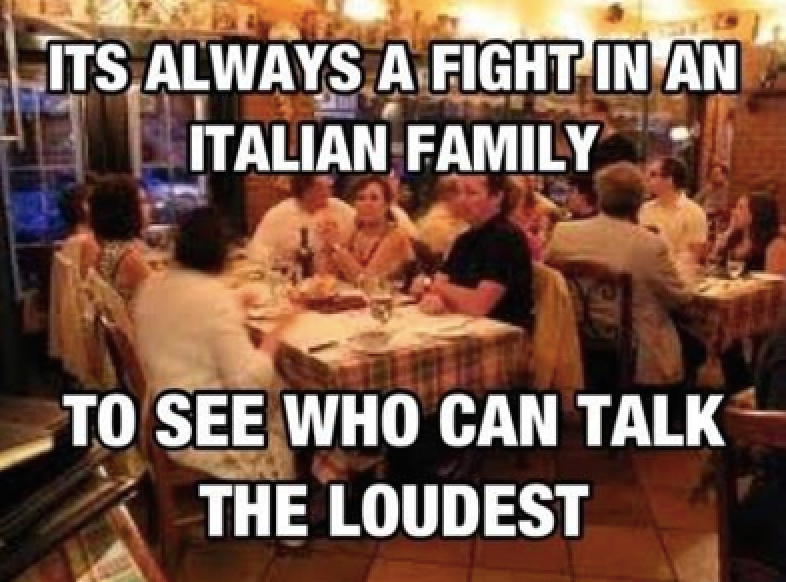 There is never a quiet moment at your family dinner table. Everyone just talks over each other, and everyone tries to be the loudest. You really have to shout if you want to get a word in. 7. You literally have two thousand cousins. And aunts, and uncles, etc. How are there so many? 8. Family gatherings are a circus. 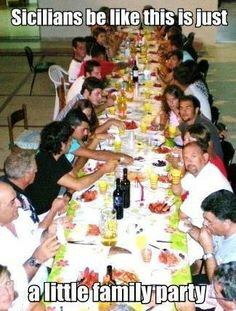 When you get the family together for reunions or holidays, it's so loud that you can't even hear yourself think. You're better off stuffing your face with food than trying to yell over everyone else. 9. There are at least four men named Joe in the family. "Eat!" 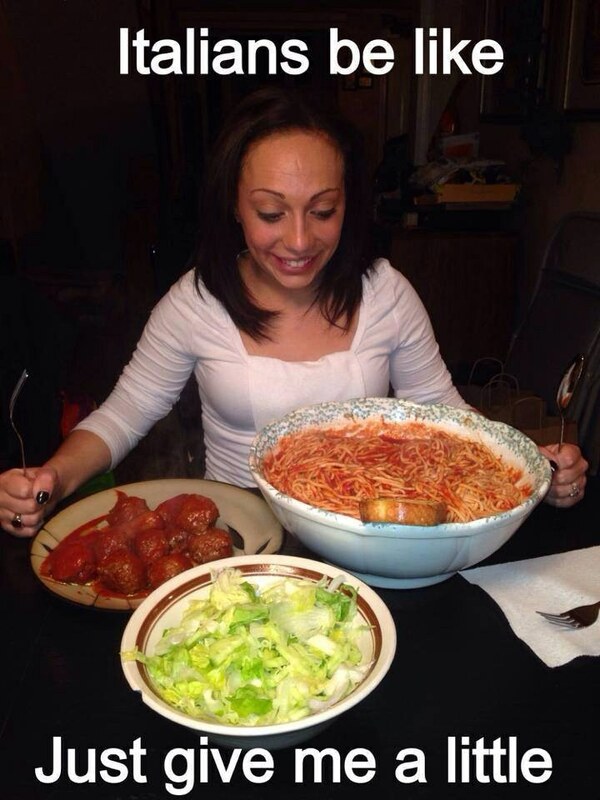 You're not leaving this table until you finish your plate, so you better "mangia!" 11. Bread is acceptable for breakfast, lunch, and dinner. Italian bread is part of every meal: toast for breakfast, meatball grinder for lunch, and pasta with bread dipped in sauce for dinner. Bonus points if it's garlic bread. 12. Parmesan cheese goes on everything. 13. Wednesday is Prince Spaghetti night. On Wednesdays, we don't wear white. 14. Everyone in the family has dark hair and eyes. If not, you're accused of being the mailman's child. Pastina is Italian penicillin! Sick? Eat pastina. Headache? Eat pastina. Going into labor? 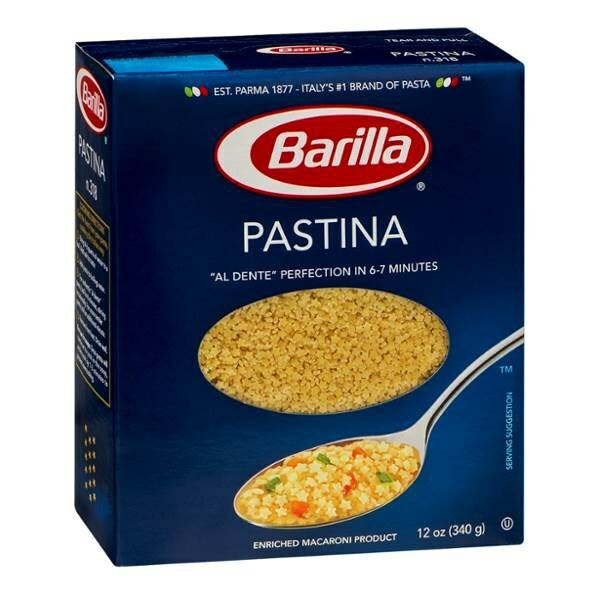 Eat pastina. 16. 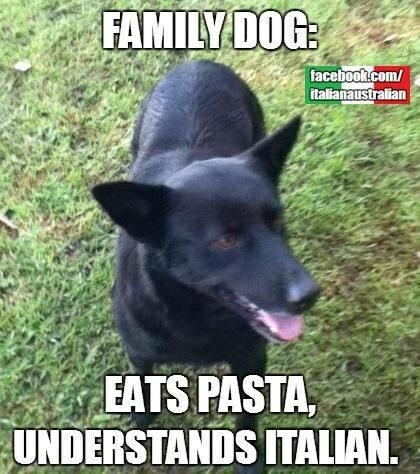 Your family pet likes pasta. 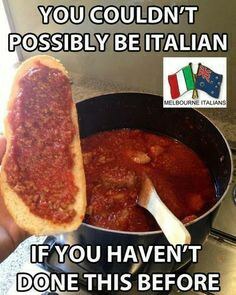 There's nothing like Nonna's homemade sauce! She wants everyone to eat her homecooked meals, even the dog. 17. 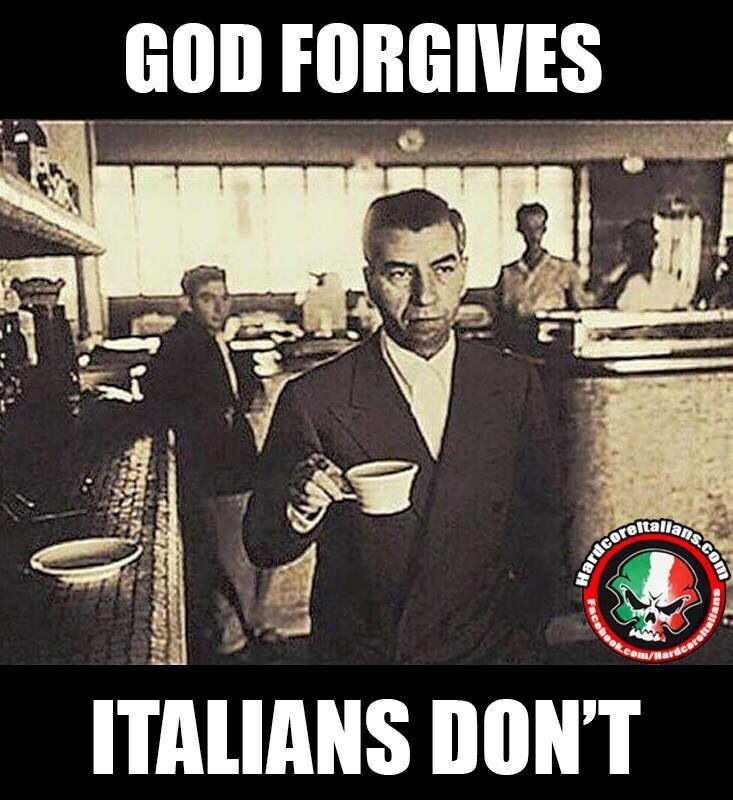 Don't even think about bringing home a boy who's not Italian. We don't call ourselves thick-headed guineas for nothing. 18. You were taught to leave the house lights on it so it looks like someone is home in order to deter robbers. Bulletproof logic right there. 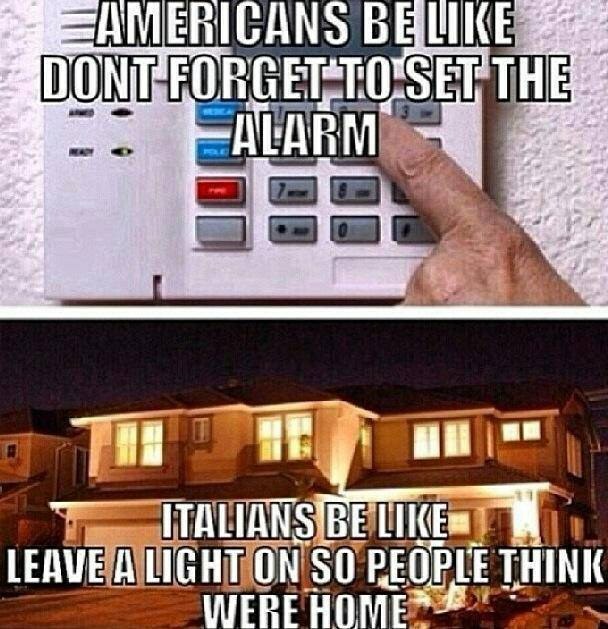 Have you ever met an Italian with a home security system? You've never heard your parents say, "do I make myself clear" at the end of a sentence. 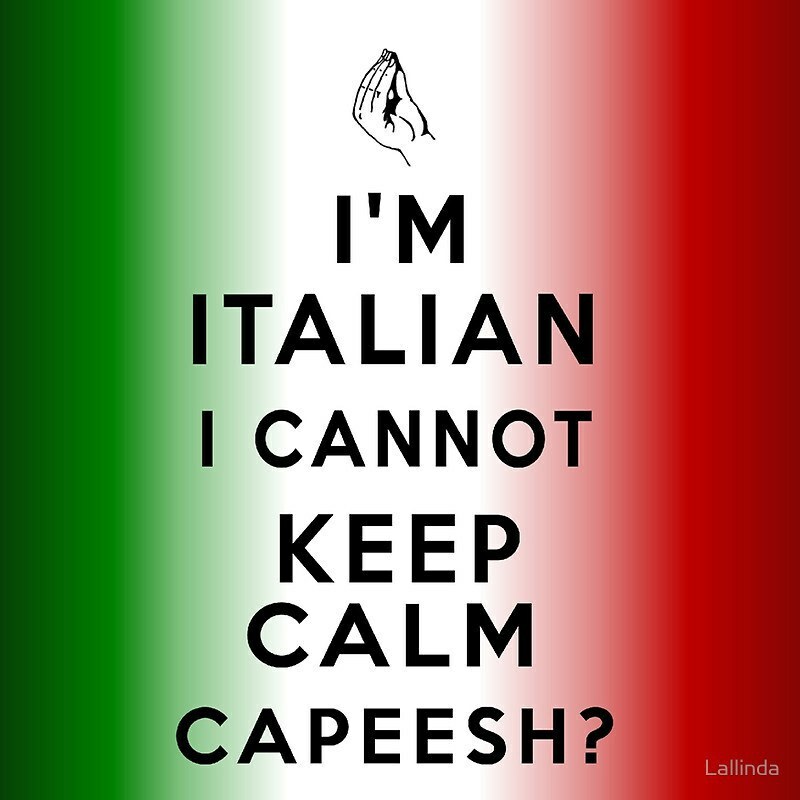 Only "Capiche?" It means, "understand?" 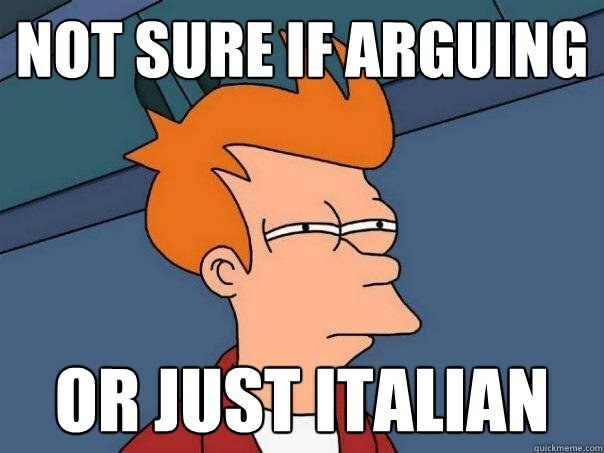 and is almost always accompanied by the go-to Italian hand gesture (See #2). 20. 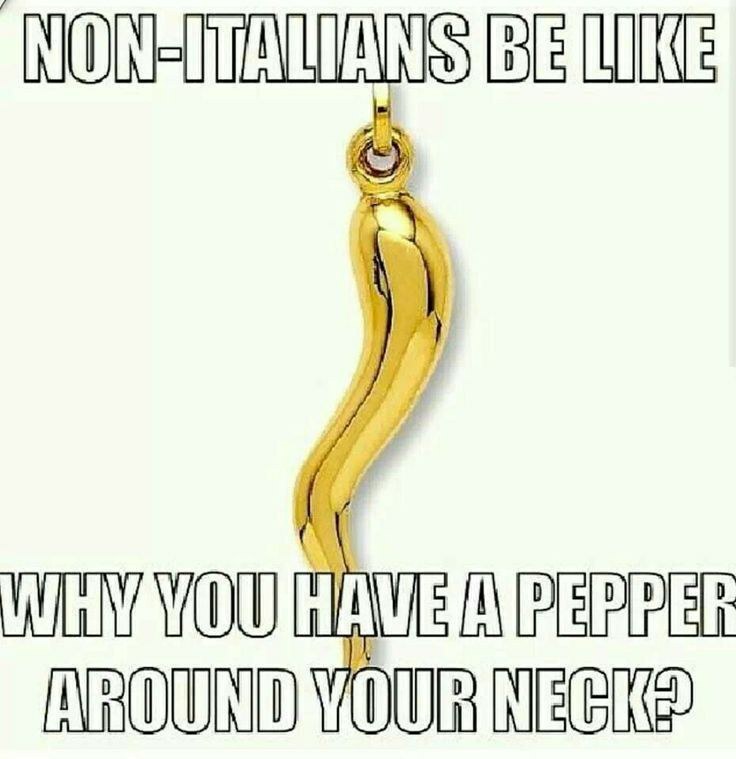 All hail the Italian horn. It protects you from the Evil Eye. 21. 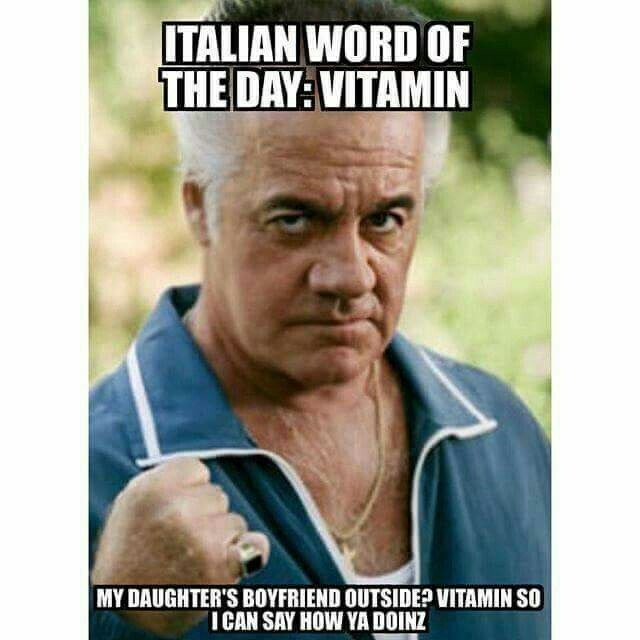 You've gotten the Sicilian silent treatment at least once. 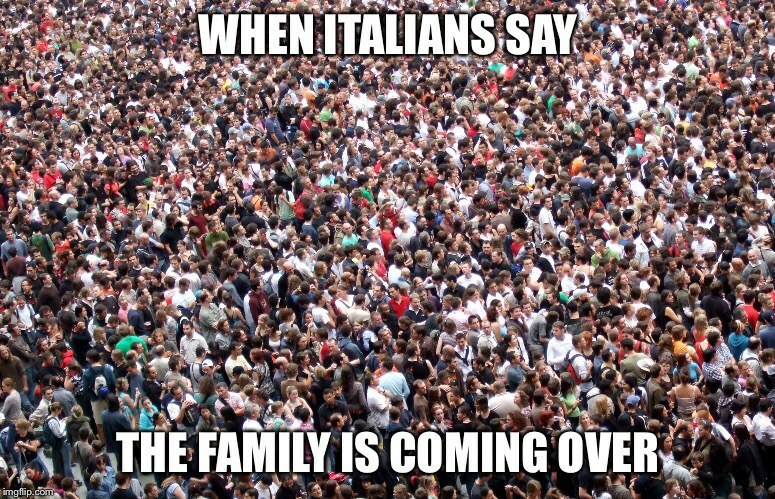 If you're lucky enough to be Sicilian as well as Italian, you know that your family is capable of straight-up ignoring your existence for the rest of your life. We take grudges to the grave. 22. You've been called "stunad!" 23. 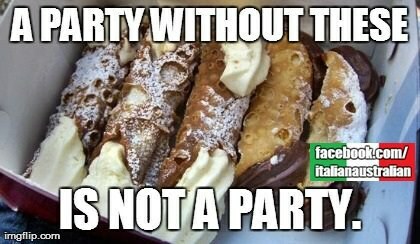 Cannolis are the ultimate dessert. 24. "Just a bite" never means just a bite. If you ask for a little bit of something, you're going to get a ton of it. 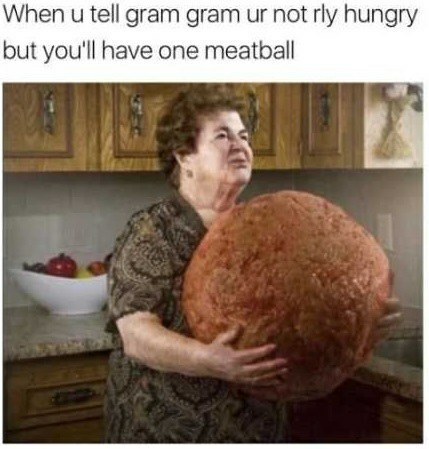 You can say "that's good," but Nonna is going to keep scooping food onto your plate. 25. When you go out to eat, you go to Italian restaurants. 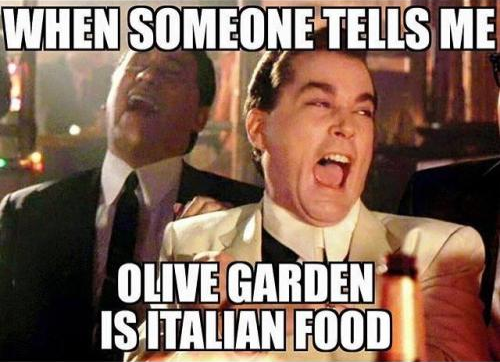 But not Olive Garden because that's not Italian.